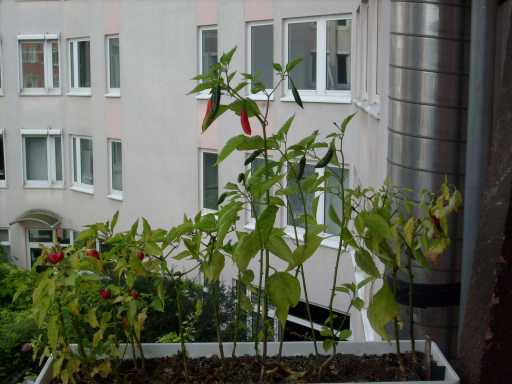 Time for another harvest of home-grown chili peppers. Over the summer, I have been growing lots of them, now the last cohort is starting to mature. Some of the earlier ones I’ve hung up to dry. 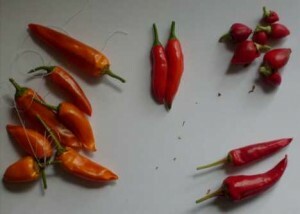 Left: Bulgarian Carrot; upper right: Tennessee Teardrops; middle: unknown; lower right: unknown, but different. Calories: A lot. If you worry about this, go jogging. A long time. Afterwards, you have the feeling that you really deserve this meal. I personally recommend running a half marathon in 1h 53m 37s. First of all, you want to be sure that you have enough chili peppers. The amount naturally depends on their hotness, measured in Scoville units (degree of dilution until hotness can no longer be detected by a human tester). 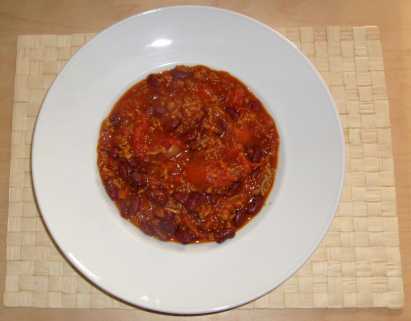 When in doubt, add more chilis; a chili con carne can never be too hot, only too bland. Take this daring young man as a role model (he cooked a hot sauce, not a chili con carne; in case you are curious, here is the recipe). In a large pot, heat olive oil. Put sliced onions in it and fry them. Add minced meat, fry. After some time, add tomatoes, beans, chili peppers, garlic, stock, cumin, salt to taste. Keep it simmering gently. Don’t forget the secret ingredient. The chili is ready when you can no longer restrain yourself and just have to eat it.